You will be automatically redirected to the new site. 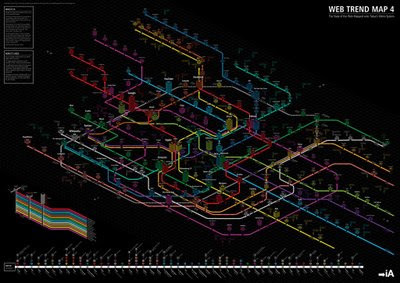 Please accept my apologies for any problems you may have reading Cool Infographics for the next few days. 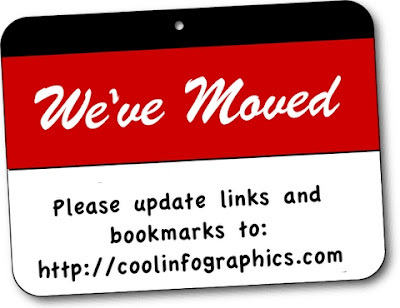 I'm taking some time over the holidays to move the Cool Infographics blog to a new host, since traffic is really low during this time. The URL, www.coolinfographics.com, will stay the same. You don't need to change your bookmarks at all (unless you're still using the old URL: coolinfographics.blogspot.com). With the new site, I'll be able to offer some additional value-added services like an updated design, an infographics job board, how-to design infographics features, an infographics bookstore, infographic software and links to infographics posters available for purchase. You feedback on these changes is very welcome. So please feel free to use the contact page in the new site design to let me know what you like or don't like. Another great new infographic comic from xkcd.com. 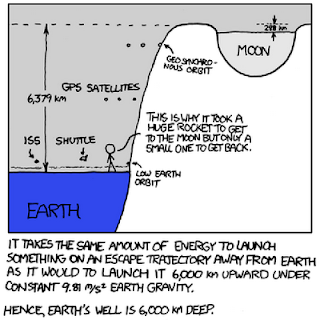 A mix of real science and humor, this one plays on the words "gravity well" by visualizing the strength of each planets gravity as the depth of a crater scaled to Earth's surface gravity. The chart shows the "depth" of various solar system gravity wells. Each well is scaled such that rising out of a physical well of that depth - in constant Earth surface gravity - would take the same energy as escaping that planet's gravity in reality. Click on the image to go to the xkcd.com site to see the high-resolution version. Thanks for sending in the link Ruben! 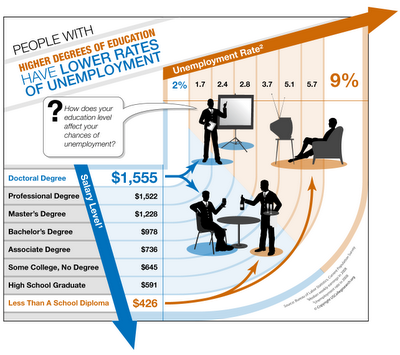 From USCollegeSearch.org, a fairly simple but good chart showing the relationship between unemployment rates and education levels. Although lacking a good title, this chart does a great job of communicating one message really well. The Bureau of Labor Statistics has found that people who finish degree programs in college earn much more over the course of their lifetimes than those who only earn high school diplomas or drop out of college. Sometimes the difference can be over a million dollars before retirement. But even more interesting, it was noted that people with undergraduate and graduate degrees manage to stay employed for longer periods, but also find jobs they qualify for more quickly. They spend less time searching and more time working. 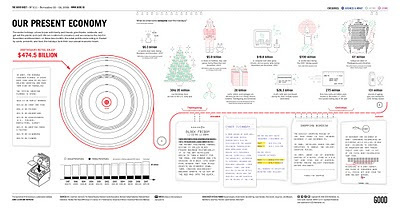 BillShrink.com presents this holiday infographic, Christmas by the Numbers, visualizing the decline in holiday spending in the U.S. and some other fascinating holiday figures. Click the link to see the high-resolution version. ‘Tis the season for Christmas trees, lights and gifts, and in the past that has also meant the season of outrageous spending. While the holidays may not be cheap, hard times sometimes call for desperate measures and drastic budget changes. Here’s a look at the hard facts and numbers of this most wonderful time of the year. 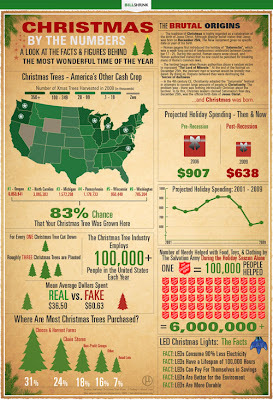 Merry Christmas from Cool Infographics! Our Present Economy is a look at holiday spending from 1997-2007 with some specifics about 2007. It doesn't say explicitly, but I believe this is for the U.S. only. From GOOD Magazine, this Good Sheet was available at Starbucks during the holiday season in 2008. I wonder how 2009 compares? 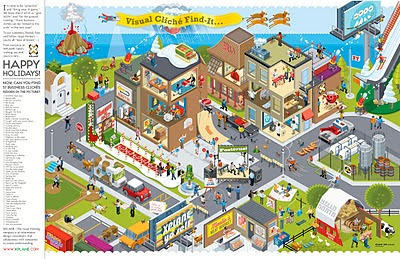 Check out this fun Holiday Cliché Find-It graphic from Xplane.com! It's available as a 11x17" sized PDF so you can view or print it out. Think you know your business clichés? Find where they're hiding in this holiday XPLANATiON™ created by your friends at XPLANE! Just click the image above to download the tabloid-sized 11x17" PDF. Both Infosthetics.com and Datavisualization.ch have posted great stories about what to give the data lover in your life for Christmas. From books to posters to software to conferences. 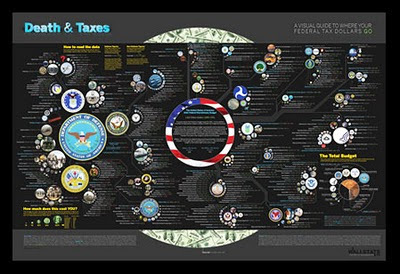 Please visit those sites to get the whole list of ideas, but here I'd like to present a few of my favorite posters made by the friends of Cool Infographics. Just click on the images to be taken to somewhere you can purchase these. 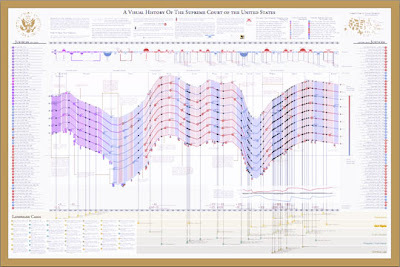 Two posters: "Cities of Champions" and "The Taxonomy of Team Names"
On Chris Harrison's site, there are a number of graphics that he calls Word Spectrums. More like a battleground, Chris is using the enormous amount of data from websites that has been made public by Google. This is an advanced form of a word cloud that visualizes related words and their relative connections to the two topics. (FYI, since this is based on raw Google data, foul language does appear in some of them). Using Google's enormous bigram dataset, I produced a series of visualizations that explore word associations. 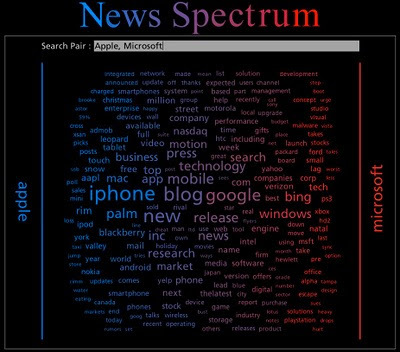 Each visualization pits two primary terms against each other. Then, the use frequency of words that follow these two terms are analyzed. For example, "war memorial" occurs 531,205 times, while "peace memorial" occurs only 25,699. A position for each word is generated by looking at the ratio of the two frequencies. If they are equal, the word is placed in the middle of the scale. However, if there is a imbalance in the uses, the word is drawn towards the more frequently related term. This process is repeated for thousands of other word combinations, creating a spectrum of word associations. Font size is based on a inverse power function (uniquely set for each visualization, so you can't compare across pieces). Vertical positioning is random. 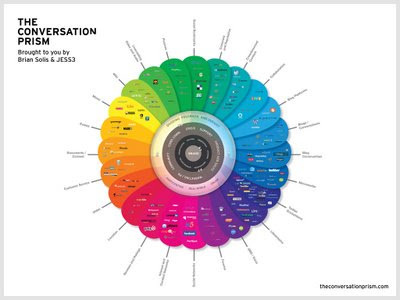 Chris has created and shared a number of different versions on the Word Spectrum page of his website, and you can see high-resolutions PDFs of each there. Want to try your own? 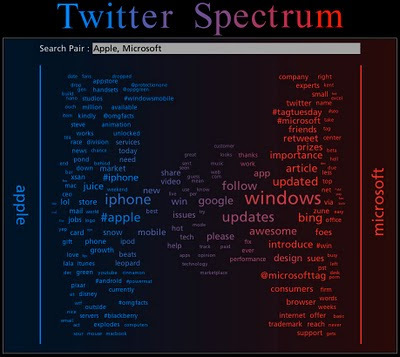 Building on Chris' idea, Jeff Clark from Neoformix has created interactive Word Spectrums using either Twitter or News as the source that lets you enter your own terms to compete. I especially like the idea of pitting two competing brands against one another. 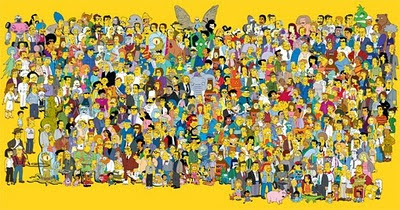 The Simpsons celebrate their 20th anniversary this week on Thursday, and CNN Entertainment published this chart "The Simpsons Comedy Tree" on Monday. 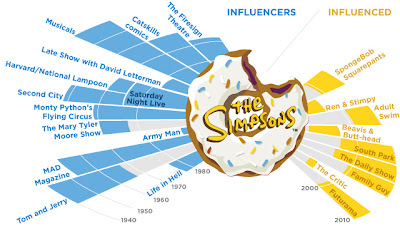 A combination Nightingale Rose Graph (also called a polar area diagram), family tree and timeline, this simple chart connects the influences that impacted Matt Groening and the creators of the Simpsons as well as the shows that came after. Thanks to Tony Hendra's "Going Too Far" for inspiration and cartoonist Art Spiegelman for having his fingerprints all over the place. The article also includes descriptions of the actual influence for each of these shows. Thanks for the link Matt! For those Simpsons fans of you, here is also the poster created exclusively for Entertainment Weekly celebrating the release of the 20th season DVD set on Jan 12. Dude, make sure to go look at the large, scrollable version. Send your own Augmented Reality Christmas Cards! 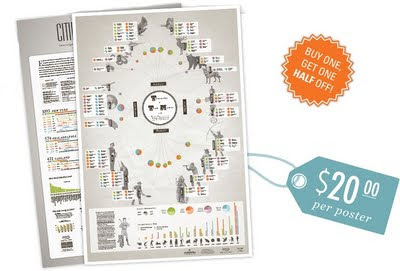 Sports Infographic Poster Deal from Infojocks!